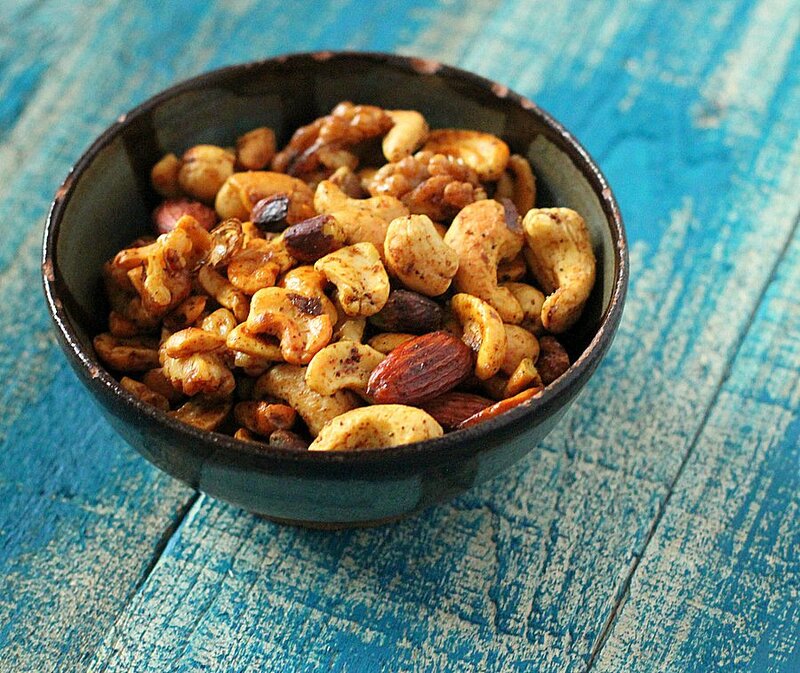 Chana Masala Spiced Roasted Nuts. vegan gluten-free snack! 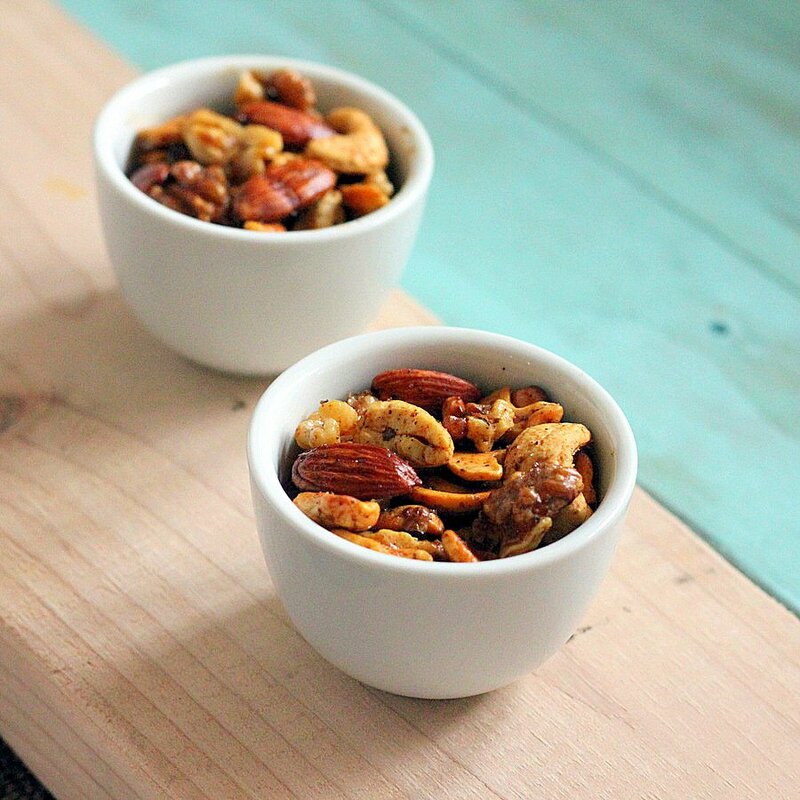 These spiced roasted nuts are super simple to whip up and are very addictive! I don’t know about you, but salty crunchy things are to me or most Indians as gooey sugary tooth achingly sweet cinnamon rolls or doughnuts! You can add any spice mix to these, some garam masala spice blend, cajun spice, chipotle pepper flakes, or some dry herbs like thyme, rosemary, dill. I usually roast the nuts in a skillet on stove top as the heat can be controlled and they take just a few minutes. The nuts can also be baked until golden. More Savory Snacks collection here. A vegan gluten-free snack! 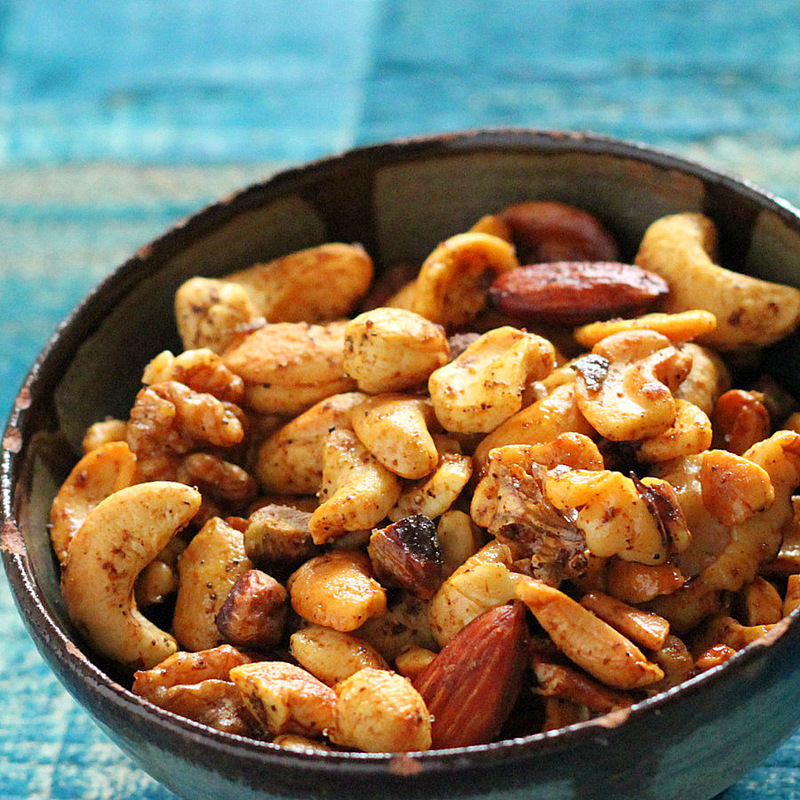 Masala Spiced Roasted Nuts are super addictive. In a large skillet, add a teaspoon of oil and heat over low-medium. When hot, add a cup of nuts(I used cashews, walnuts, pecans, almonds, pistachios), salt, black pepper and chana masala spice blend to taste, and mix to coat well. Take off heat. The nuts will continue to roast for the next 2-3 minutes once off heat too. The Omega fats in the nuts can burn and damage easily, so roast them to just a light golden. Cool completely, adjust salt and spice. Snack! You can also bake these for about 12-15 minutes at preheated 330 degrees F. Stir once after 10 minutes and check on them. Oven temperatures vary, so keep the temperature on the lower side. You can roast the nuts on stove or bake with no oil too, the spices and herbs might not stick as well. For Variation: add a 1/4 cup of dried fruit like currant, cranberries or raisins after 5 minutes of roasting. « Potato Leek Subzi with fennel and mustard seeds. vegan glutenfree. wow very healthy snack …. What a beautiful cause. Look at those beautiful creatures…yes I mean the nuts and the animals. an I adopt the nuts and the animals? Thank you for doing this. i know these are very addictive! Thanks Terra. Yes these stay fresh for a while.. if they can stay untouched there for that long! :) Hugs back! i too sometimes make nuts this way with the indian spices. such a beautiful cause. i am with you and support this fully….. Thank you Dassana! Lets get the fundraiser rolling ! these sound like a fabulous snack! love it! 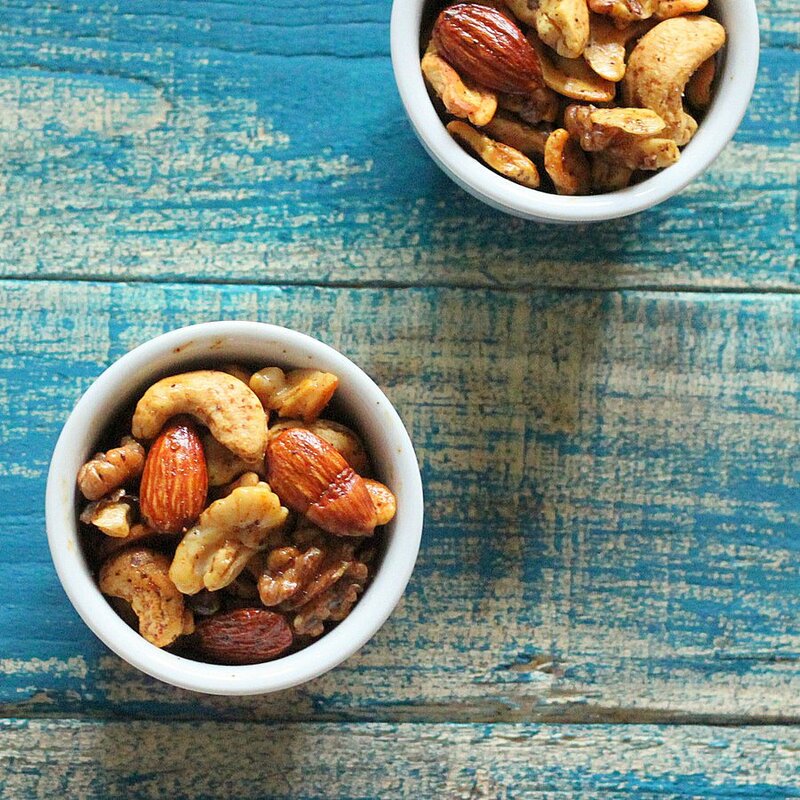 I love nuts any which way – they are my go to quick snack before working out! what a nutri-licious idea for the family tea time snacks. 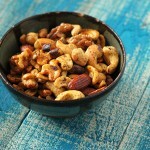 i’ve always been a fan of assorted nuts and these look amazing! What a wonderful and healthy snack! Very tempting! That looks like one incredible snack! 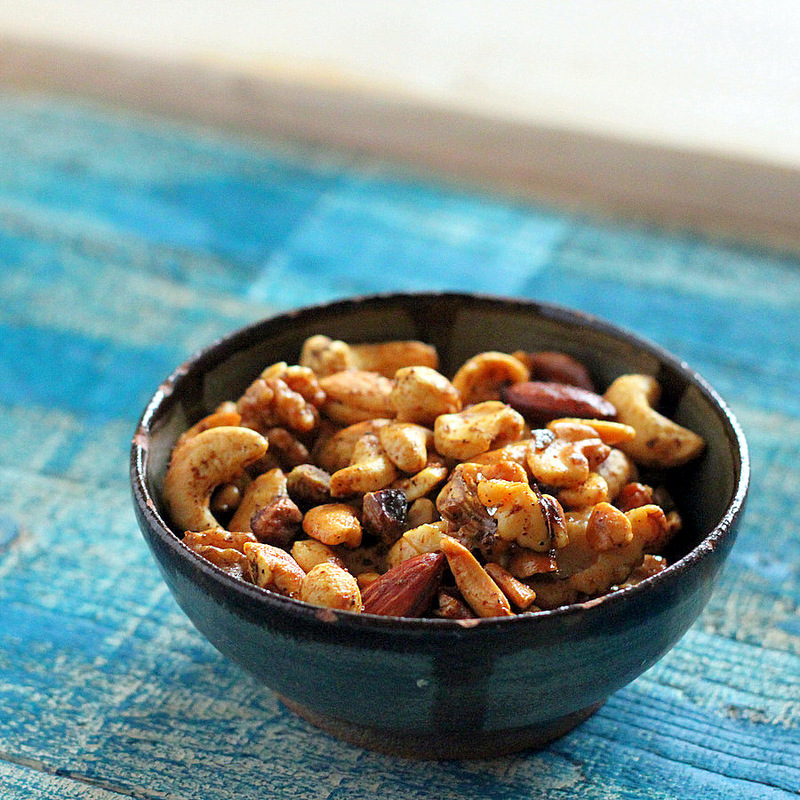 I can’t keep spiced nuts like this around the house, because they’re far too addictive. I know I’d go through a whole batch in mere days, without any help! This looks delicious! Thanks for sharing on Allergy-Free Wednesday!